If you are working in an office you must be knowing about Minutes of Meeting (MoM). They are consist of all the major points or issues discussed during the meeting. They can be used for various types of meetings, for instance, a corporate meeting, board meeting or any other kind of meeting. So the minutes act as a record of what was the agenda and details about the meeting. They contain all the important decisions and conclusions that were agreed during in a meeting and can be used in the follow-up process. Typically a minute of the meeting follows a simple and straightforward style of writing and must include the vital details such as the date, time and venue of the meeting, and of course the detailed summary about the agenda of the meeting. Here through this article, we shall try to explain to you about the various formats about the minutes of a meeting and the various situations in which they can be used. So through this article, we shall provide you with some samples of various formats of the minutes of meeting templates in a professional format. So after going through this article, you shall learn about how to structure your minutes of a meeting and the correct one and language to be used while writing it. As you know minutes of the meeting can be used to state the agenda of various kinds of meetings, be it corporate, club, or any kind of formal or informal meeting. In most of the cases, a secretary notes down and keeps the record of all the minutes of meetings. So in each meeting, the minutes of the previous meeting is discussed and then the minutes are systematically organized to keep a record of each meeting. 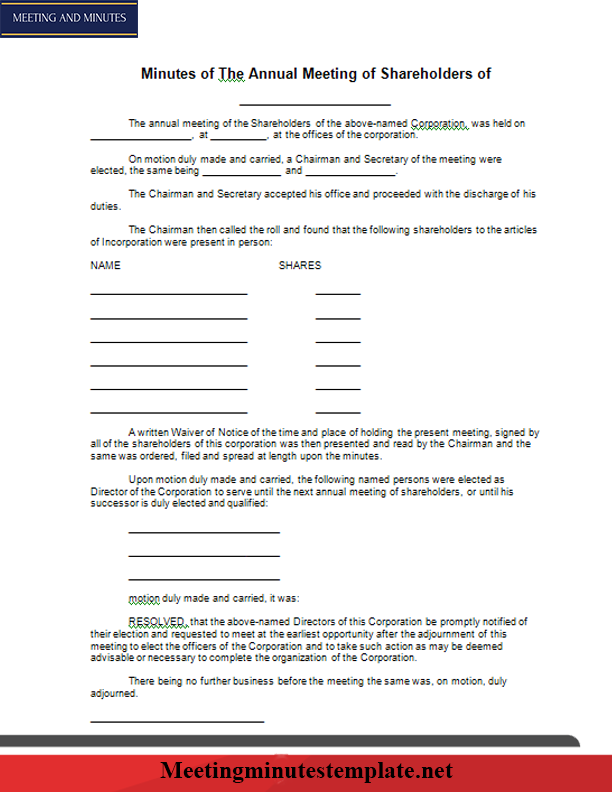 The minutes of meeting template Word Doc format is one of the most commonly used formats to create minutes of a meeting. 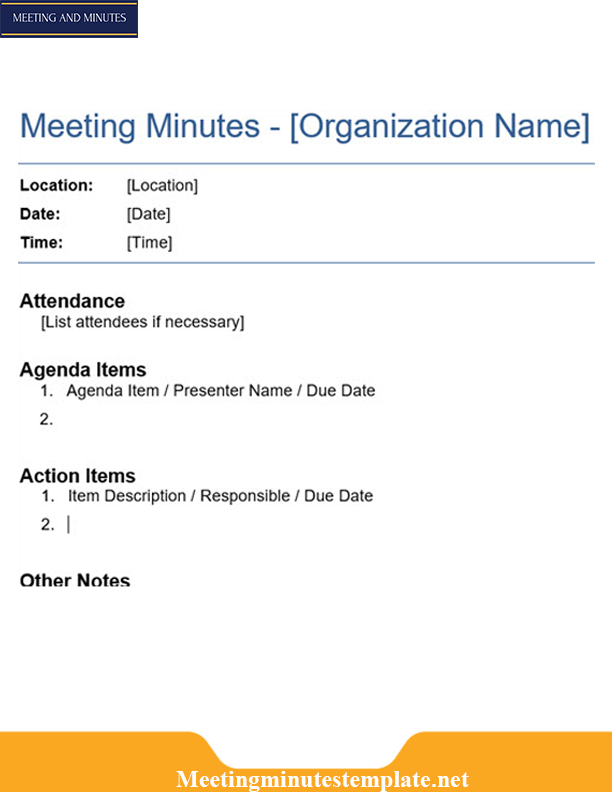 It can be used to create a modern format of minutes of meeting in a basic and clear layout. This template clearly lists the action points taken and the deadlines. This template can be used for creating formal or informal minutes of a meeting and follows a simple and formal style of writing. Here given below is an example of minutes of meeting template doc format. 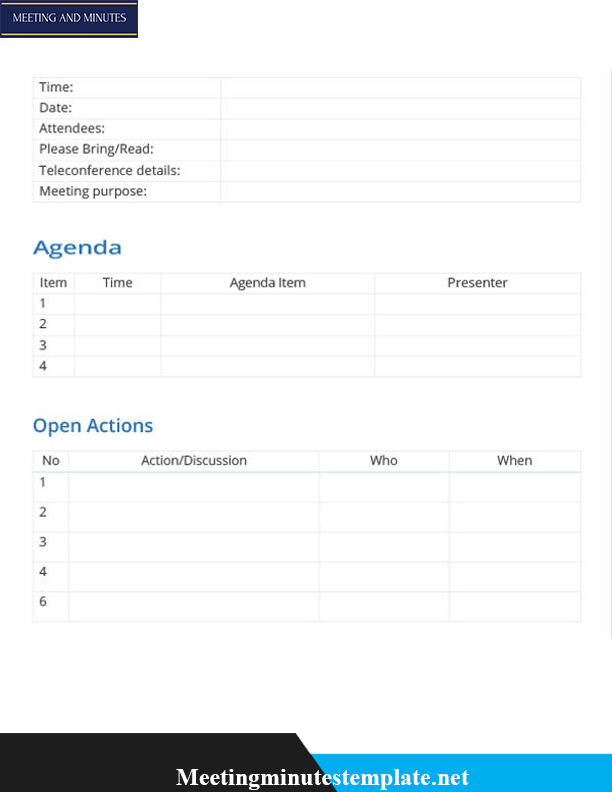 You can use this template to learn how to write a simple basic meeting minute and the language used to write a meeting minutes. Meeting minutes can be written for both formal and informal meetings. 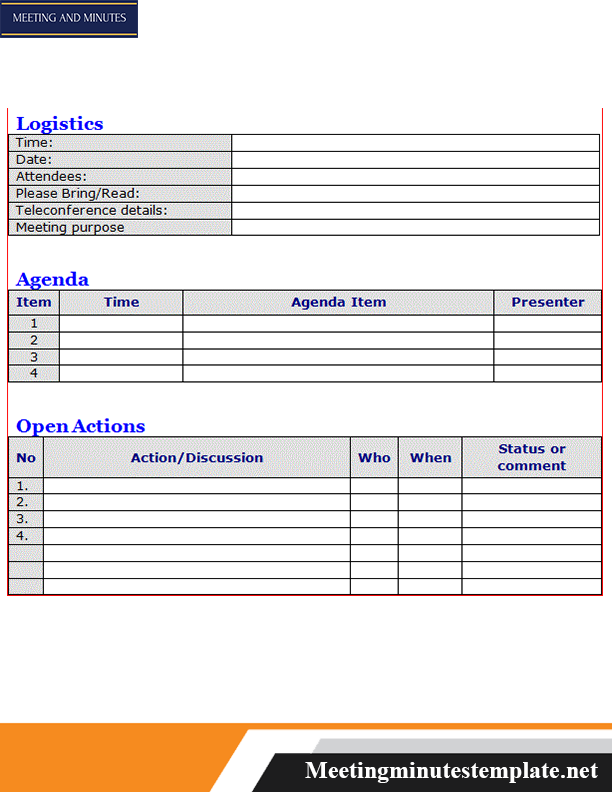 A meeting minutes excel template is mostly used for official meetings such as a board or corporate meetings. It is used to create an official format of minutes of the meeting and systematically note down all the important information such as venue, the name of participants, discussion and conclusions in order and plan of action to be taken. So it helps you record all the information discussed in the meeting in a systematic manner. We have provided you here with a template of meeting minutes template excel so you can use it to learn the format, language and expressions used in formal meeting minutes and use it to create your own minutes meeting. If you want to create a meeting minute for an organization like a school, office, clubs, etc, then a simple meeting minutes template is the right option for you. This template allows you to write all the information in a clear and organized layout. So even if you could not attend the meeting, it becomes easy for you to know who conducted the meeting and what was the agenda discussed in brief. Here given below is a simple minutes meeting template which has been provided in a PDF format. So it can be useful for you to learn how to write a simple meeting minute in a professional format. You can also download and customize it according to your requirements. Most of us are aware of the Google doc and know about all its features. Google docs can also be used to create minutes of meetings. Most of the office and business setups prefer using Google Docs to create their documents since it has many features and is easy to share. It also provides many ready-to-use templates, including meeting templates, which can be used to create professional meeting minutes. From here you can get meeting minutes to google docs which you can download and print from here. So you can customize and use them to create official meeting minutes in Google docs. A minute of the meeting is generally used for corporate or board meetings. So a meeting minutes template with action items is the best way to note down the plan of action decided during the meeting. It is very helpful during board or staff meetings, where the next actionable plan needed to be taken is decided by the members present. So the meeting minutes can be used to record these action plans and create deadlines for them. So the minutes of the previous meeting can be used to remind of the previous action plan and what steps have been taken to implement it. So on that basis, new action plans can be decided in the current meeting and noted down in the meeting minutes. And all these minutes can be ordered systematically and kept in the minutes binder of the office. 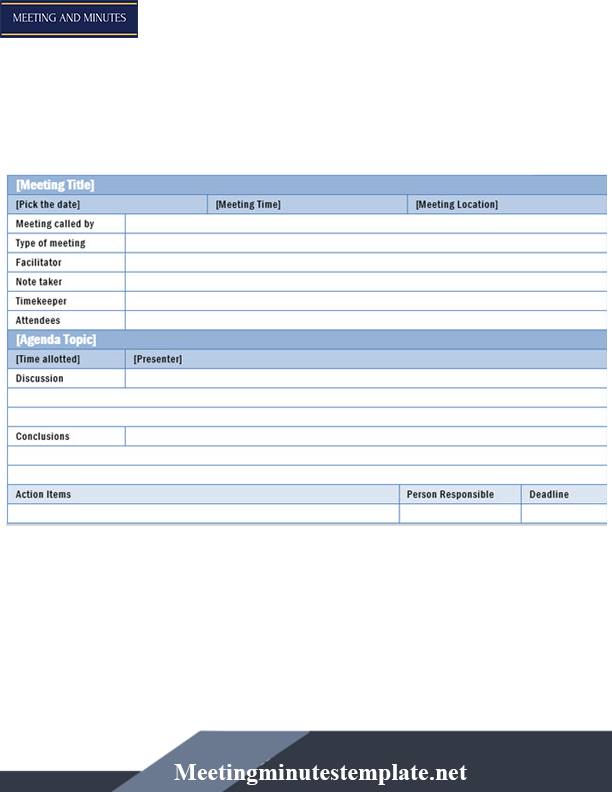 The meeting minutes with actionable items templates contain spaces for writing the actionable plans which would be agreed upon during the meeting. So it would be easy for you to write down the action plan in brief along with the deadline allotted to each task or project. Meetings are arranged frequently in corporate and the business world for various reasons, such as brainstorming upon ideas, discussing projects or entering into a contract. So in such situations, a professional meeting of minutes template is most suitable, where you need to write down the detailed discussions systematically and briefly. 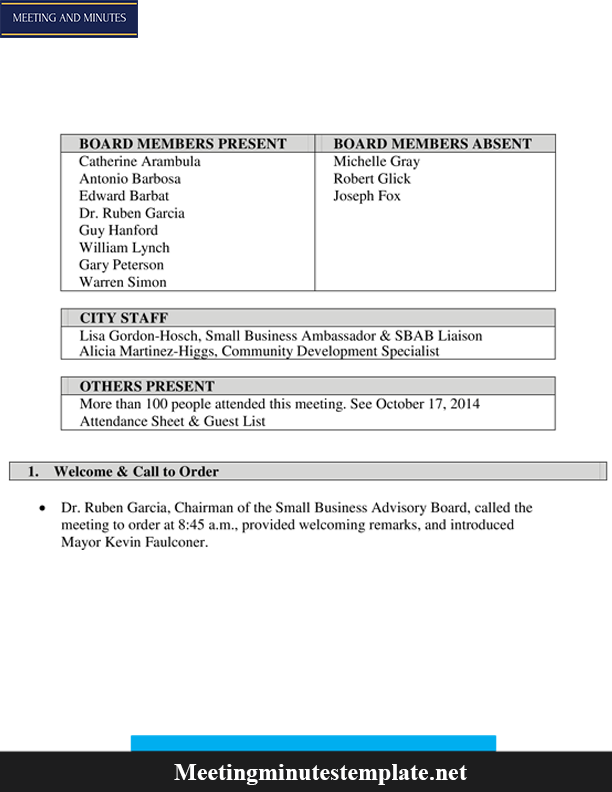 So this template covers details regarding the actionable points discussed, agenda of the meeting, etc. in a orderly format. Board meetings are attended by the higher authorities of the company such as the Directors to discuss the overall goals and plan of actions to be taken for the company. So various important discussions might be taken up during this meeting. 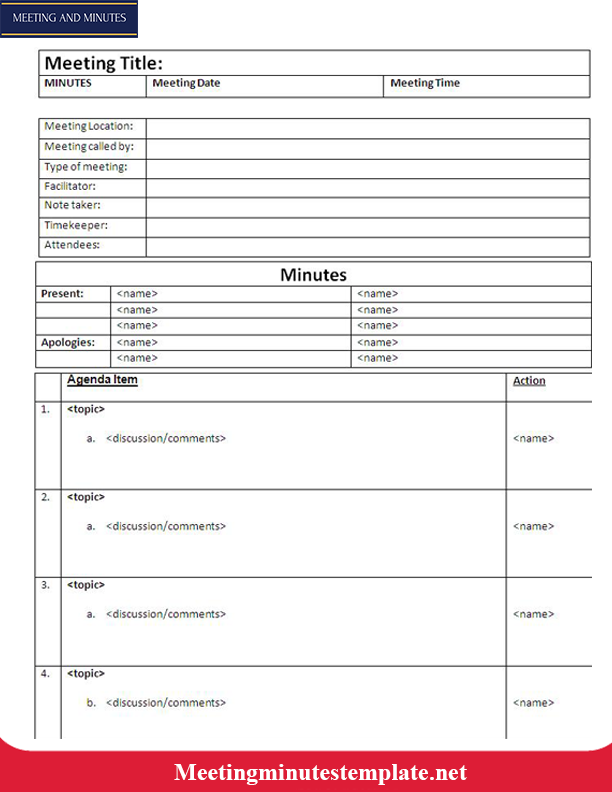 Here we have provided you with an example of Board Meeting Minutes template which allows you to record all the details and agenda of the meeting in a clear manner. It contains various information such as the discussion details, date and time of the meeting, place of meeting and presiding members of the meeting. Here we have given an example of a board meeting minutes so it will be easy for you to create your own professional board meeting minutes. 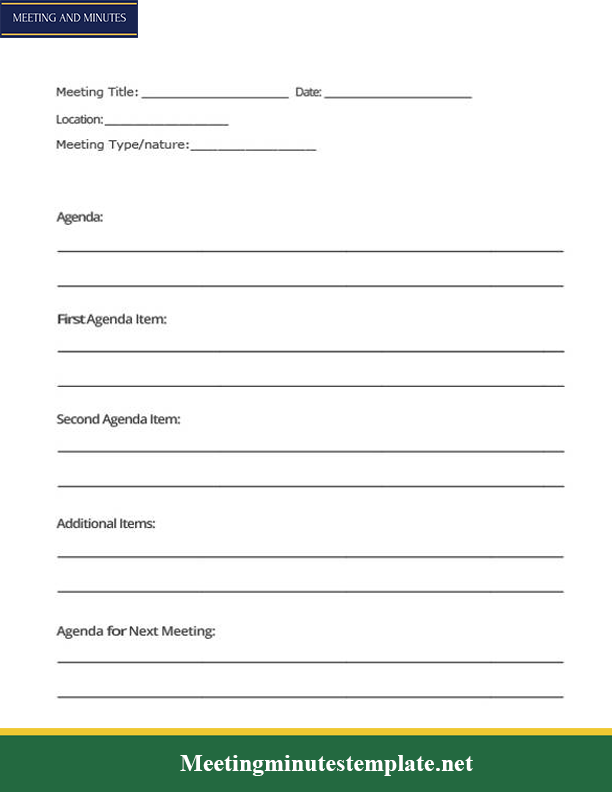 For meetings conducted in a corporate setup, like office meetings, a corporate meeting minutes template is ideal for systematically noting down all the important points discussed during the meeting. 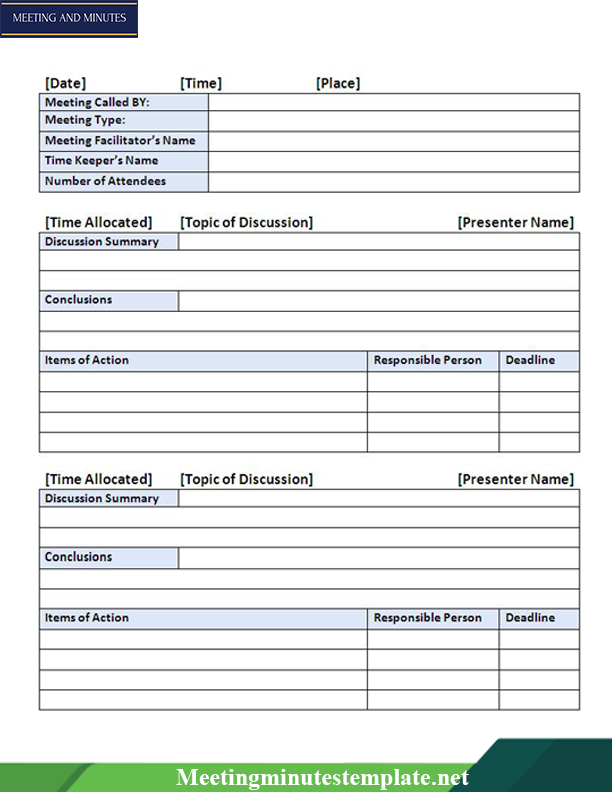 To make it easy for you to learn to create your own corporate meeting minutes template, we have provided you here with a sample of corporate meeting minutes template. A non-profit institution has its own board and management, like regular businesses. So they conduct meetings on a regular basis where all important points may be discussed as to how to run the operations of the organization smoothly. A Non-Profit Board meeting is written in a formal manner, including the name of the persons attending, agenda of the meeting, Director’s or President’s report, etc. Although no particular format is there which needs to be strictly followed to write down the minutes. You just need to ensure that the minutes fulfils the purpose of recording all the important details about the meeting in a concise manner. 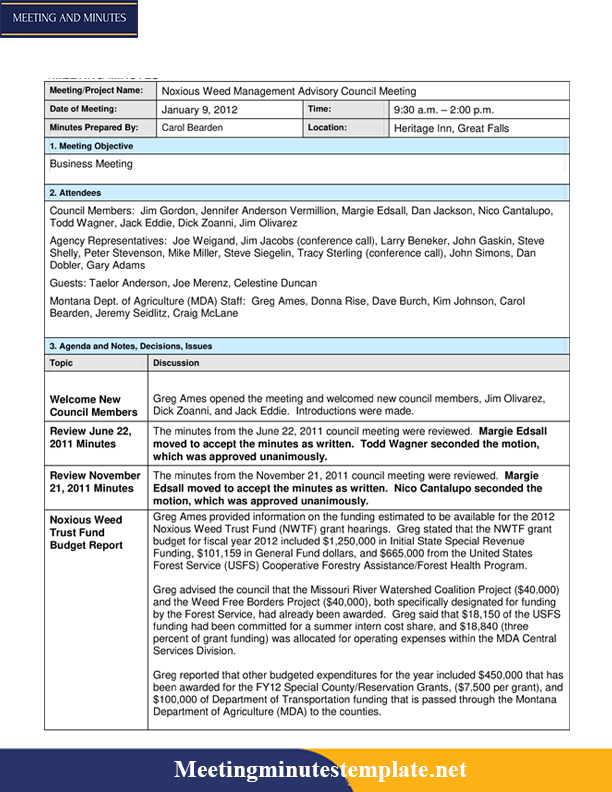 Here we have provided you with a sample Non-Profit Board Meeting Minutes Template so it will be easy for you to know the format of a professional non-profit board meeting minutes. A staff meeting may be organized in every organization in a week or so to follow-up regarding the previous meeting and plans of actions needed to be taken immediately. So a lot of things might be discussed in detail and conclusions might come up so you need to write all them precisely and to-the-point. 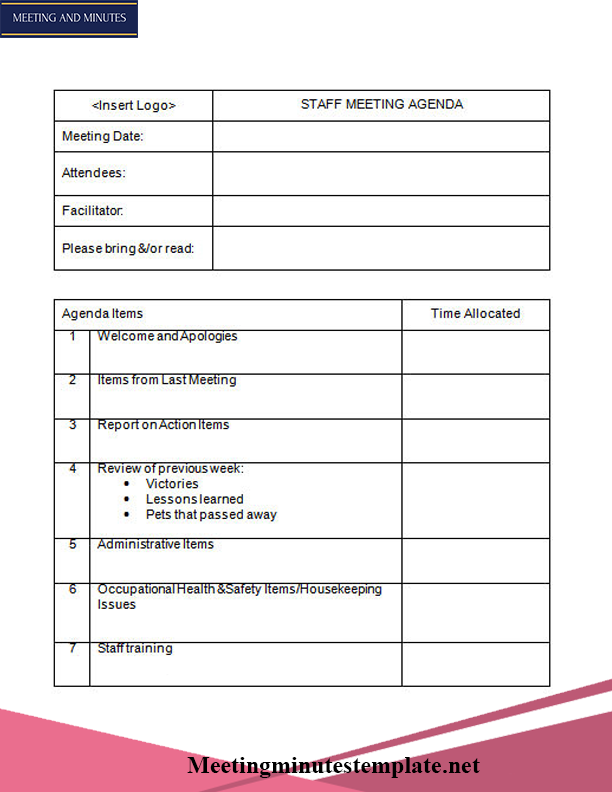 So a staff meeting minutes template contains all the important details such as the details about the attendees, subjects for discussion and time frames allotted for each topic discussed. So here we have provided you with a free sample of staff meeting minutes template so that you can conduct a meeting smoothly and ensure that all the topics are covered in a clear manner. So we have discussed and tried to cover all the major meeting minutes template and provide you with their examples. 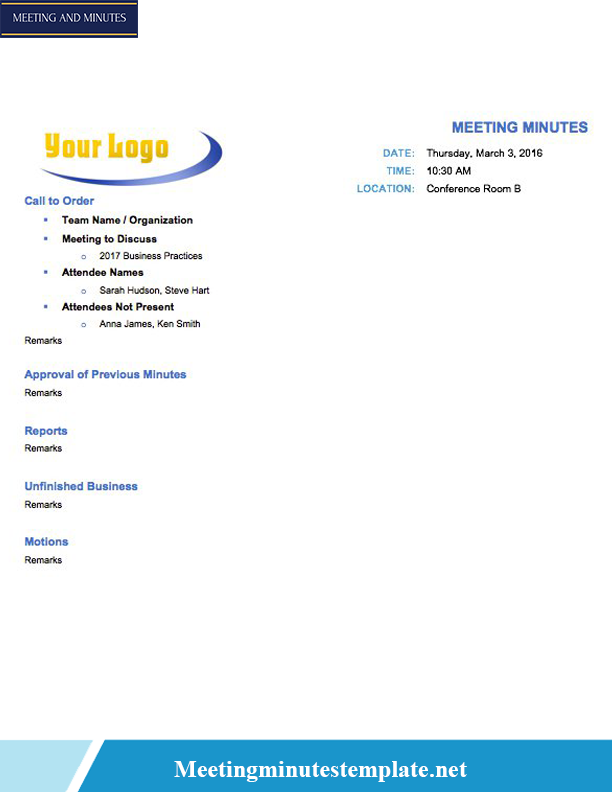 You can select any of the templates according to your requirements and create your own minute’s meeting template. If you have any doubts or want to give any suggestions you can feel free to contact us.